"Healthy banana nut breakfast smoothie that tastes like banana nut muffins! Wholesome ingredients make one creamy, sweet smoothie!" Visual Learner? Watch this Banana Nut Smoothie recipe from start to finish! Has your June been crazy like mine? Between planning for Ethan’s birthday party, traveling to graduations, non-stop cookbook cooking, building a studio kitchen (again), kid activities …..woooooosaaaaaah! I wish I was one of those people that can totally flourish with a lot going on. You know, the movers and shakers that have no problem with hopping from coast to coast in a day while juggling phone calls, meetings, etc. That is not me. At all. I’m a Taurus. I like balance. Peacefulness. Calm. One thing at a time kinda girl. Life is rarely like that though so I’ve learned many tips and tricks to maintain my sanity. Sometimes it’s as easy as making a quick smoothie for breakfast and prepping dinners for the week on Sunday. I always meal prep when I know my week is going to be insane. It frees up so much mental space and time when meals are ready to go. Lately, I’ve been all about smoothies for breakfast. Like seriously, are smoothies not the BEST hot weather breakfast ever invented? I don’t have to turn on the oven, they come together in minutes, the kids love them, they’re filling, they cool you down, and you can enjoy them on the go. Major summer breakfast win! 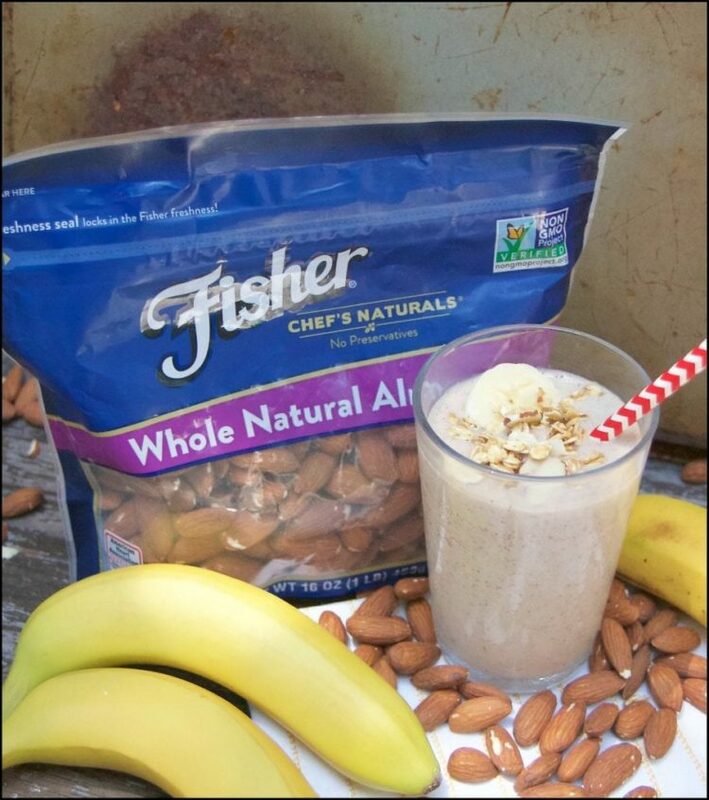 Today I’ve teamed up with Fisher Nuts again to bring you one of my favorite, Banana Nut Breakfast Smoothies! This is the fifth recipe I’ve done with Fisher Nuts! You can check out the other delicious recipes I’ve done with Fisher Nuts below. 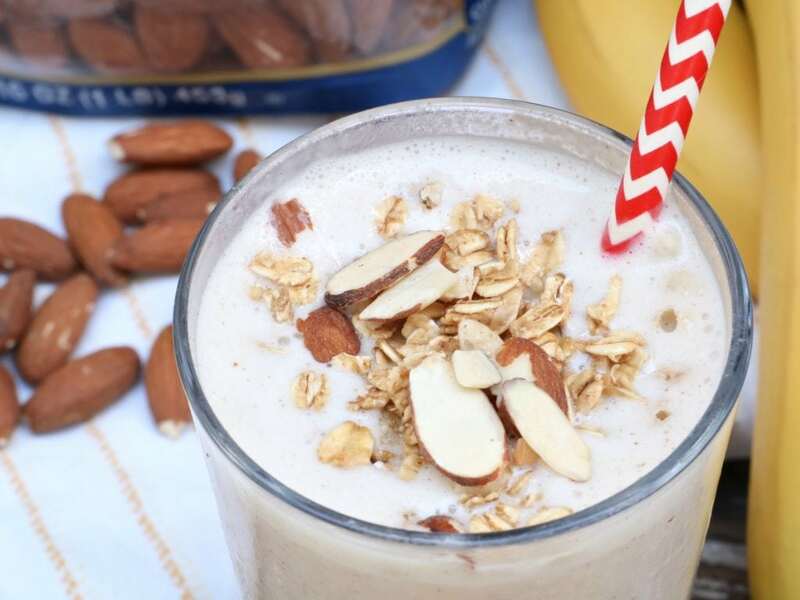 This Banana Nut Breakfast Smoothie is the perfect way to use up ripe bananas. I’ve made it several times this month! Feel free to sweeten it with honey, sugar or dates but honestly, I don’t think it needs it if the bananas are ripe. The secret to this creamy smoothie is the homemade almond butter. Turning the almonds into a butter/paste keeps the smoothie from having that powdery aftertaste and really bumps up that nutty flavor! I love using Fisher Nuts for my almond butter. Fisher Nuts are fresh out of their shells with no preservatives and are non-GMO project verified. 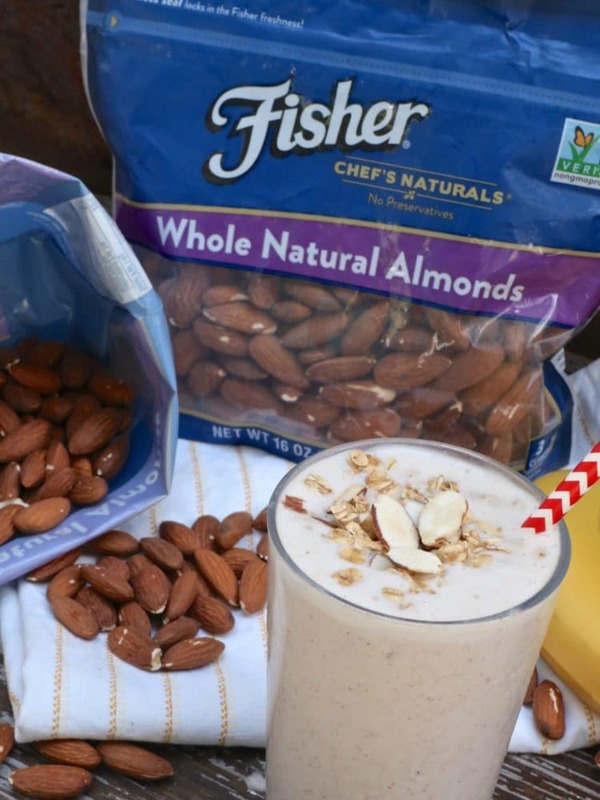 Simply scoop 1/4 cup of Fisher Nuts Whole Natural Almonds out of the handy, resealable stand-up bag and place them into the blender first. After pulsating them for a few seconds you’ll have almond flour. Continue pulsating and the flour quickly turns into a thick almond butter, perfect for smoothies. Then just add the rest of the ingredients into the blender and done! Now you see why this has been my go-to, quick and easy breakfast this month! This banana nut smoothie is so delicious and you don’t even have to turn on the oven to enjoy that homemade banana nut muffin flavor! Add almonds into a high-powered blender and blend until it resembles almond paste. Add in bananas, almond milk, cinnamon and vanilla extract. Add in ice and blend until creamy. Garnish with sliced almonds and granola if desired.